An interesting and difficult stage separates A Fonsagrada from Pobra de Burón, if this route is chosen on the previous day-from O Cádavo, capital of the council of Baleira, where the next public hostel is located. 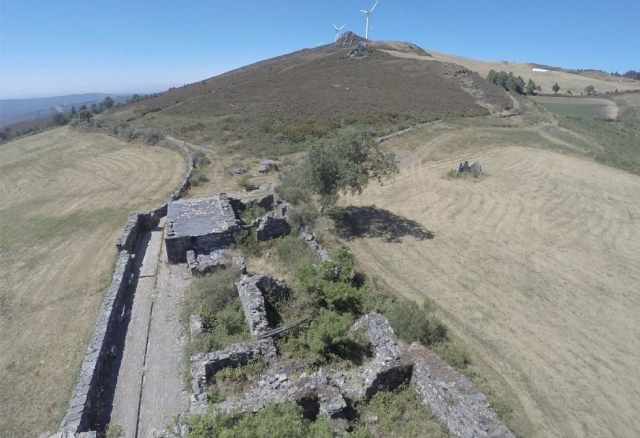 The walker will await beautiful mountain scenery, paths surrounded by nature and the ruins of the last active pilgrim hospital in Galicia. Pilgrims will not encounter many people on their Camino. Passing a handful of small hamlets-Paradavella, A Degolada, A Lastra, A Fontaneira…- that still conserve traditions (houses, thatched buildings) and some interesting churches. These places, very unpopulated, don’t have much in the way of services aside from the odd bar/shop and even then they are often closed. It is therefore advisable to take provisions or supplies and go well equipped, especially during cold and rainy months. Pilgrims who spent the night in A Fonsagrada -many begin the Primitive way in this town-, should walk along the side of the road that joins Lugo and this town-where signposts should be improved-towards the public hostel of San Xoán of Padrón. Passing through Vilardongo to the ruins of the Hospital of Montouto. From the former hospital, hikers face a steep descent, the type that tests even the most agile of knees. Afterwards, it is best to collect provisions in Paradavella, where there is no accommodation. Following walkers embark on a smooth stretch, the beautiful but hard climb to A Lastra. It is not long, little more than one kilometre but its steep slopes make it seem eternal. In O Cádavo, an invisible place for pilgrims until reaching a sign for the public albergue of the council, with 24 spaces and under floor heating. Just one steep descent separates them from this days end goal, a fairly recent location and without much charm, but with the benefit of all kinds of services: restaurants, bars, a chemist, a health centre, supermarkets, shops and even a hotel. It is worth recovering strength and purchasing supplies to face the following day, the next goal on the journey of the Primitive way: The ancient city of Lugo. 1 reviews Distance to Santiago: 155 km. 1 reviews Distance to Santiago: 140 km.